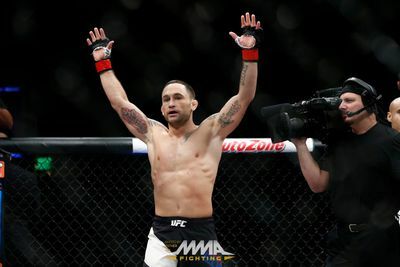 “The Answer” knocked out Chad Mendes last night and, as a result, UFC president Dana White said he is getting the next shot at the Featherweight strap. Frankie Edgar (21-4-1) fought Jose Aldo for the Featherweight title and lost in his divisional debut. Now, after five straight wins since that setback, he could be getting another shot to capture the 145-pound belt. Edgar, 34, knocked out Chad Mendes (17-4) with a brutal left hook (watch video highlights here) to win the main event of The Ultimate Fighter (TUF) 22 Finale last night (Fri., Dec. 11, 2015) inside “The Chelsea” at The Cosmopolitan in Las Vegas, Nevada. And immediately afterward he let it be known he should be next in line. Along with the knockout of Mendes, the former UFC Lightweight champion has finished Cub Swanson and B.J. Penn on his current five-fight win streak. He also has unanimous decision wins over Urijah Faber and Charles Oliveira. In a post-fight interview with Ariel Helwani on the FOX Sports 1 post-fight show, a beaming Edgar said what he said in the Octagon about White was “all love” and that when he spoke with UFC’s president he was told he’s next in line for a title shot. DOES DONALD “COWBOY” CERRONE HAVE A CHANCE AGAINST ROBBIE LAWLER AT UFC 205?